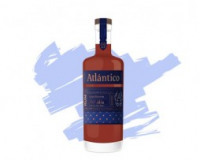 Atlántico Rum utilizes a unique process developed by it’s 3rd generation master blender for the creation of Atlántico. It begins with the selection of the finest small batch aged rums from the Dominican Republic. Once the individual rums have been selected, they are blended together to create something truly unique. The blend is then aged further (private cask), which results in a mellower, more complex rum. From the private casks, the Rums are placed in another set of barrels for 15 to 25 years. This third aging uses the solera method most commonly used with Sherry production which guarantees consistently balanced rum. Only when the rum has reached its perfect state is it removed from the barrels and bottled by hand. Delivery charge is £7.99 per consignment for single bottles and £6.99 for a case of six bottles upto 12 bottles, every additional 12 bottles incurs an additional £6.00 charge. Northern Ireland - Delivery is charged at £34.99 for a case of 6 bottles only, additional charges apply for greater quantities. Please be aware this service is between 2-3 days for delivery.